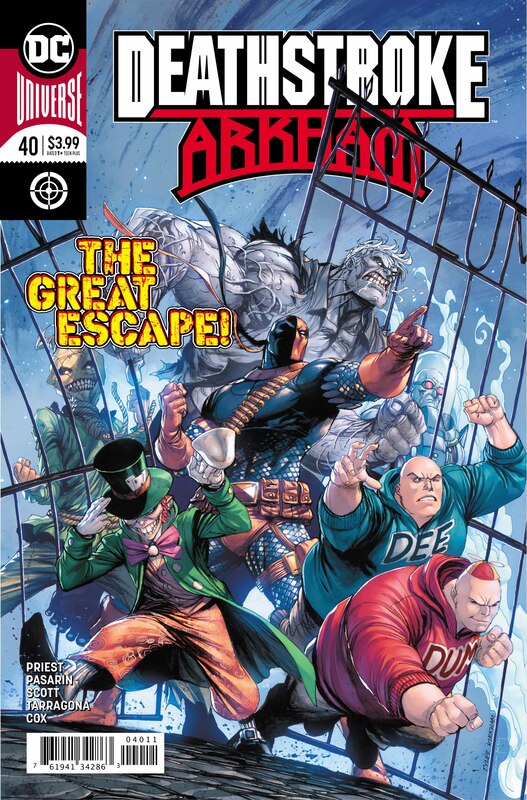 Slade Wilson makes his great escape from DC’s most famous loony bin, as this week’s Deathstroke #40 concludes the mind-bending “Arkham” storyline. After the conclusion of the “Chinatown” arc, Slade finds himself in the Asylum. 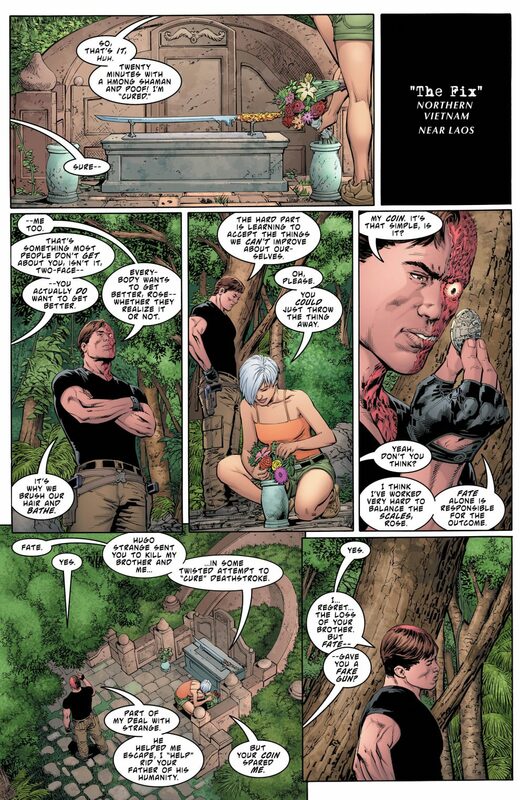 Drugged to his eyeballs, Deathstroke continues to question his sanity and thereby his perception of events. While delivering more questions than answers, Deathstroke #40 attempts to wrap up the loose ends of this arc, as Slade confronts Hugo Strange, the villain responsible for perpetuating his supposed mental instability. The Rose/Two-Face subplot is tidied up as well, as the two villains part ways. Finally, the utterly bizarre Death Masque/Pulorian story also finds its resolution … kinda. 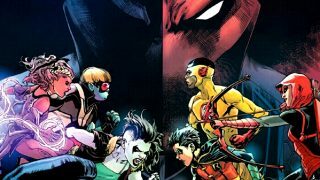 Deathstroke #40 also sets the stage for the next arc – a followup to the Lazarus Contract, which will feature the Teen Titans. For the past four issues, Priest has explored the connection between perception and reality. 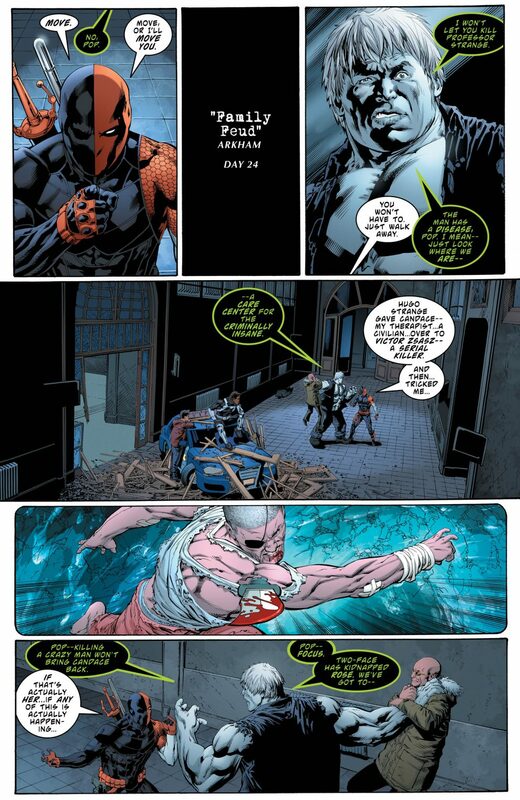 At various moments throughout the “Arkham” story, he has offered multiple explanations for Deathstroke’s situation. Slade either is crazy and therefore hearing Wintergreen in his head, or he has a neural implant. 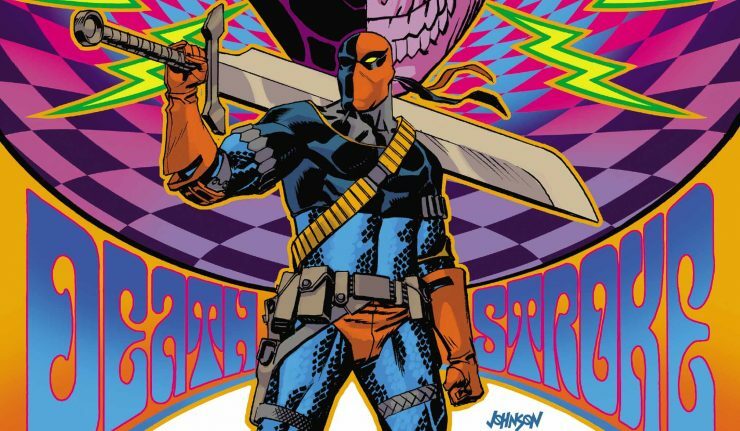 Deathstroke was either abducted by an alien race, or he’s simply hallucinating. 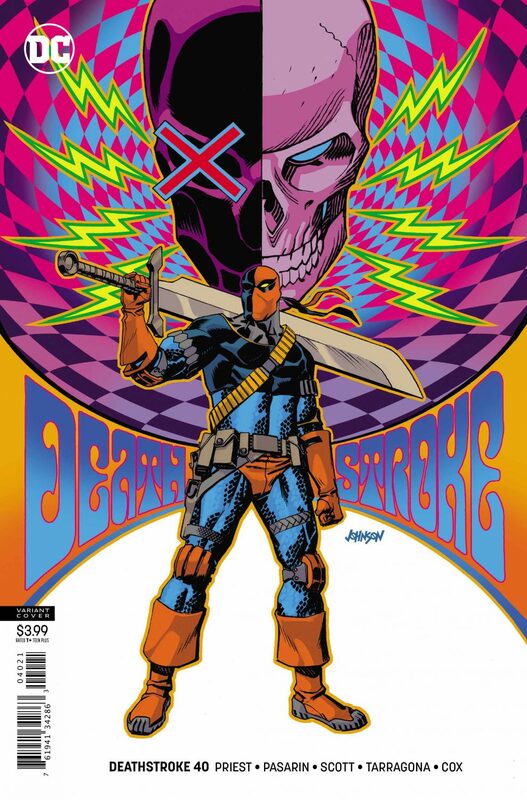 Deathstroke #40 is no different. For example, at one point, the reader is unsure if Deathstroke and Death Masque are fighting the Pulorians invaders or a bunch of hobos in a park. At just about every point in this story, Priest makes the reader question the very narrative they’ve been presented. Essentially, the theme of this arc is summed up by Hugo Strange when he asks Deathstroke, “What is reality?” After reading this issue, I’m not sure that even Priest could answer that question. 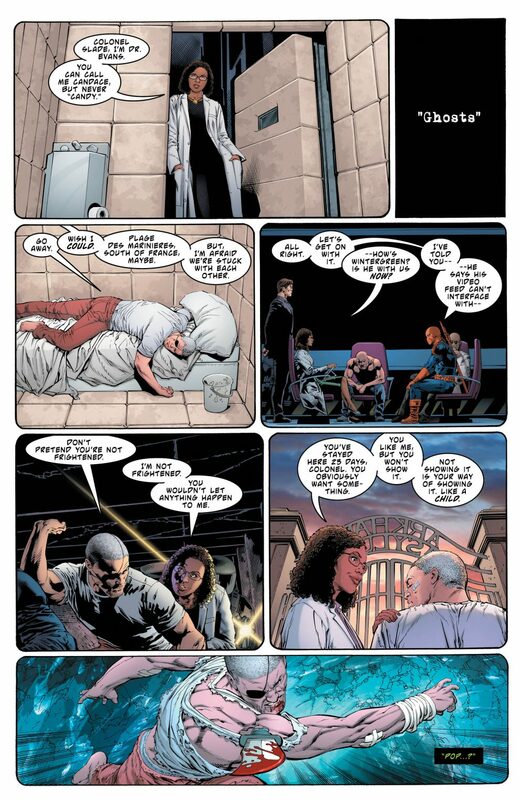 It’s as if the “Arkham” storyline exists in a state of quantum uncertainty (see Schrödinger’s cat). Both explanations given are valid interpretations of what has occurred in the arc. Carlo Pagulayan and Fernando Pasarin once again team up for the pencils on this title. As always, their work looks great. In this particular issue, they do an amazing job with the action sequences. 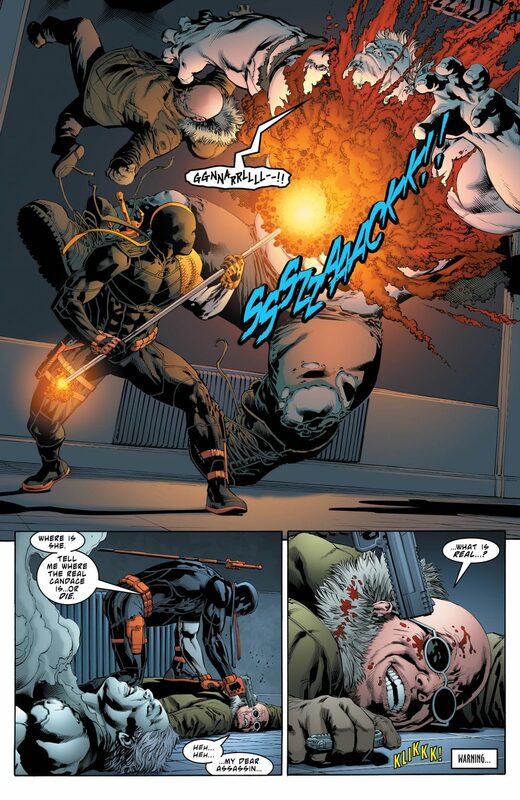 Deathstroke’s fight with Hugo Strange is beautifully kinetic. There’s a lush two-page spread depicting Slade dodging a blast from Mr. Freeze. Seriously, it’s pure eye candy. Deathstroke #40 is not an easy read. The story is not straightforward and, in many ways, the resolution is not naturally satisfying. However, the convolution seems intentional in an attempt to create something profound. Priest’s script has transcended the pulpy pages of traditional comics, passing into the realm of “Art” (with a capital “A”). He uses the trappings of Superhero fiction to tell an incredibly thought-provoking story about the nature of reality. 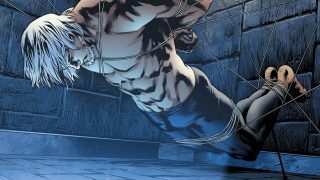 While it may not be easy reading, Deathstroke “Arkham” is definitely worth your time.